I love a good historical romance set in the 1800s so it's wonderful to see a walking dress and fabric samples. I had a good look at the hooks, ribbons and buttons, wow no wonder these ladies needed a maid to help them dress. 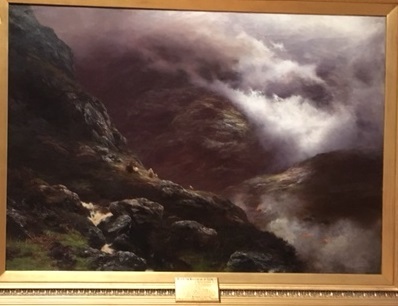 The great thing about this room it also had a painting that shows a landscape that may appear in my highlander novels.